Nice large size shakers are made of heavy ceramic and have black designs of cows. 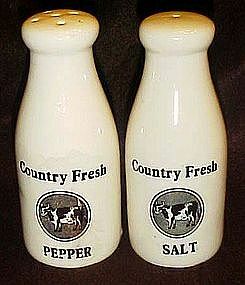 Each says either, Country Fresh Pepper, or Country fresh Salt. Nice large size measures 5 1/4" tall and has nice large pour holes. Perfect condition, with stoppers.